The fork oil seal is easier to get out when you warm up the outer tube. 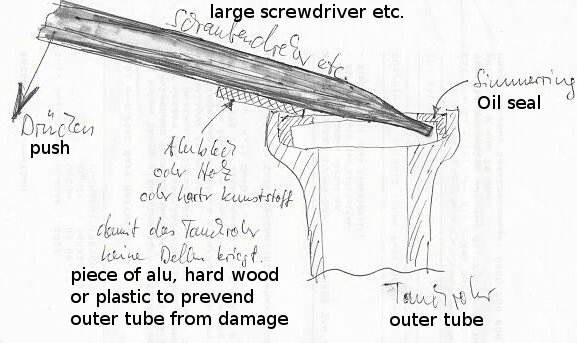 I found an old sketch of mine, showing to lever out the ring with a screwdriver. In this way only if you have new oil seals for replacement. Last edited by markush on Wed Nov 02, 2016 8:54 am, edited 1 time in total. In this way only if you have new oil seals. If you warm the outer tubes enough, the ring goes out very easily and you do not need much force, so the risk of damage by slipping with the tool is low. Of course you have to be careful. The seal has a steel L-profile ring inside the outer wall, so you normally will not touch the seat. I actually made one of these this weekend and woweee..it really works...I made mine with 1/8" steel instead of 3/8"..slightly easier to work with.....heated metal prior to bending..i felt like a smithy hammering and bending the metal...bought used drill press for $60...and away I went...was very impressed with design and more to the point is that I actually made it...took a couple of hours but whatever..i never thought I had it in me to do this type of thing..yeah..its a big deal for someone like me....anyway the point is that this tool works so CLEANLY and there is no danger of damaging the fork tube.....mine is actually all shinny too....three cheers for me! I have always pried them out with a motorcycle tire iron. The curved end of the iron has no sharp edges to scratch the inner tube and provides plenty of leverage. An old tube, piece of wood, rubber etc. as Markus shows in his picture keeps the iron from doing any damage at the fulcrum point. Someone shared this tip with me years ago and I've used it dozens of times with success.